Lee Selby will get his shot at the IBF featherweight world title. The Welshman outclassed Joel Brunker for nine one-sided rounds and can now sit and wait to find out when and who he will be fighting for the title. 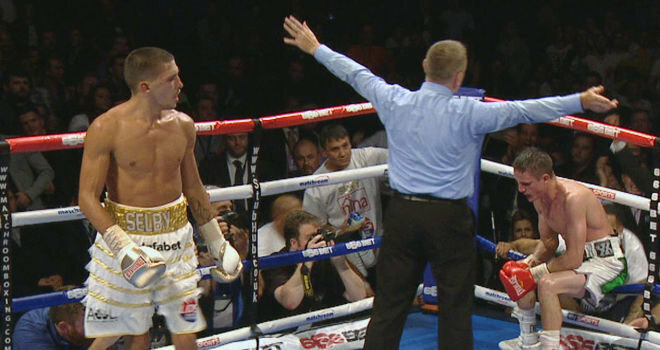 Lee Selby gives his reaction to Sky Sports after victory in his IBF eliminator showdown with Joel Brunker. The current champion Russia's Evgeny Gradovich defends against Jayson Velez in November but whoever he faces, Selby looked ready for the challenge. The ninth-round finish was clinical and class and showed that after a quiet start, he is now ready to mix it with the very best in the featherweight world. It was certainly easier than many expected with the Australian visitor also unbeaten and rumoured to be ready to give Selby his toughest test to date. A cautious start from the Welshman suggested just that but by the second round he knew he had Brunker's number. A nice left-right combination showed his skills and by the fourth he was picking the Australian at ease. Selby then threw his jab into play and that kept him not only in front but also in control of what was turning into a fairly routine win. However by the fifth there were signs that Brunker was as tough as many though and soaked up more shots, without effect. The first shot took his sails away and then he moved in with a left-right-left, not once but twice, then a left to the head that finally left Brunker almost sitting on the bottom rope, barely able to balance, never mind box back. The referee rightly stepped in and with a record of 20-0 now, Selby could well be Britain's next world champion. "There still a very, very lot more to come," he told Sky Sports. "As soon as I can bring my sparrign skills in the gym into the ring you will see a true champion, who can mix it with anyone." "As soon as I can bring my sparrign skills in the gym into the ring you will see a true champion, who can mix it with anyone"
Lee Selby stopped Joel Brunker to win his featherweight world title eliminator at the O2 Arena in London. The Welshman outclassed his Australian opponent with the referee stepping in late in the ninth round. The 27-year-old's win over the previously unbeaten Brunker earns him a meeting with Russia's IBF world champion Evgeny Gradovich. British and Commonwealth champion Selby vacated his European title to clear the way for a shot at a world title. Selby went on the offensive from the first bell and used his speed well until shaking Brunker with a straight right and an uppercut in the fifth round. But Brunker, who sparred with Selby at Floyd Mayweather's Las Vegas gym two years ago, regained a little ground over the next couple of rounds despite some damage above his right eye. A huge body shot from Selby in the ninth was the prelude to the decisive combination of punches from the Barry fighter that saw referee Marcus McDonnell step in to end the fight. "I've been guilty of coasting through my fights because I've been finding it so easy," Selby told Sky Sports. "But this was a final eliminator. I had to prove I was ready to fight for a world title." Olympic champion Anthony Joshua made it nine wins out of nine professional fights with a brutal second-round stoppage of Denis Bakhtov. The 24-year-old heavyweight, who took Olympic gold at London 2012, claimed the WBC international title with his comprehensive victory over the Russian.